Our service is tailored to offer the complete solution to travel information providers. As part of our service we also offer innovative solutions to add value to our customers. 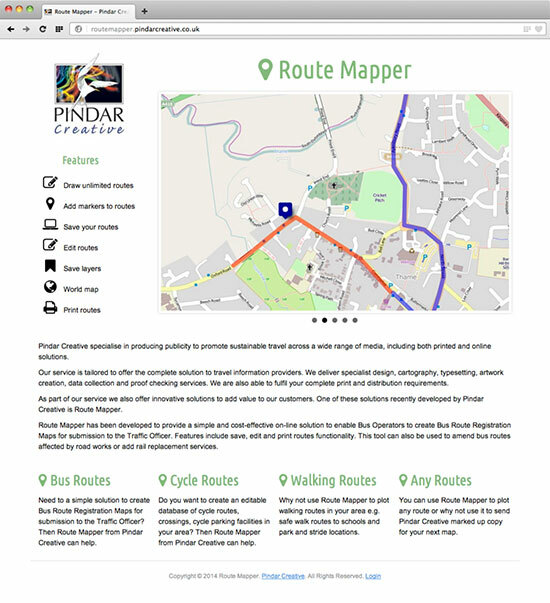 One of these solutions recently developed by Pindar Creative is 'Route Mapper'. Route Mapper has been developed to provide a simple and cost-effective on-line solution to enable Bus Operators and Local Authorities to create Bus Route Registration Maps for submission to the Traffic Officer. Features include save, edit and print routes functionality. This tool can also be used to amend bus routes affected by road works or add rail replacement services.